In some versions of the Bible, we find this psalm as the final portion of psalm 42. It may begin in this manner: Grant me justice, O God; defend me from a faithless people . . . Or it may begin differently: Vindicate me, O God, and defend my cause against an ungodly people . . .
No matter the style, the psalmist here presents the universal plea humans have when they come to God: I see myself as wronged . . . and I want you to put things right. The Meditation in MAGNIFICAT today serves as a perfect solution for our very human desire to seek vindication; it speaks to our peace of heart. This is an idea we investigated from time to time when we look at the troubles Job experienced. Each of us lives a life of trial in one way or another and it is for those times that Saint Paul of the Cross, the founder of the Passionists, writes: The easiest way to keep your peace of heart is to accept everything as coming from the hands of God who loves you. If you do this, any pain or persecution, anything which is difficult to accept will be transformed into a source of joy, happiness, and peace . . . This does not mean to say that God sends disaster to trip us up. Nor is this saying that God delights in punishing us. The opposite is true. God so loves us that when calamity occurs, God wishes most to transform all damage and harm into goodness and fruitfulness. This is why it is imperative that we maintain constant, open contact with God . . . otherwise we will misinterpret all that happens to us and around us. St. Paul continues: Silence and recollection are two very effective ways of bringing ourselves before the Lord and entering into the sanctuary of [God’s] love . . . When a person comes to terms with his feelings, when he lives in God and walks by the light of faith, he has attained that stillness of the night which God is waiting for. It is then that the Word of God comes to birth in him in a way which is entirely of God. Remain within your deepest self, in the interior kingdom of your spirit. Remember that your soul is a temple of the living God. “The kingdom of God is within you”. We may have difficulty in finding these quiet times to be still and so St. Paul continues with this counsel: Night and day let your aim be to remain in simplicity and gentleness, calmness and serenity, and in freedom from created things, so that you will find joy in the Lord Jesus. Love silence and solitude, even when in the midst of a crowd or when caught up in your work. By living in the world but not of it, by keeping our line of communication with God open and clear at all times, we will understand better what we are to do when disaster strikes – as it always does. We will be more prepared to see the goodness that can come from cataclysm – as it always can. We will sink less into despair, we will rise more into joy. We will find what St. Paul of the Cross calls a certain peace of heart. When we suffer – as we do – when we are wronged – as we will be – when we wrong others – as we are bound to do . . . rather than seek vindication, let us seek peace of heart. For when we maintain faith and seek joy, peace arrives . . . and all else will fall into its perfect place. Cameron, Peter John. “Meditation of the Day.” MAGNIFICAT. 20.10 (2009). Print. A Favorite from October 20, 2009. 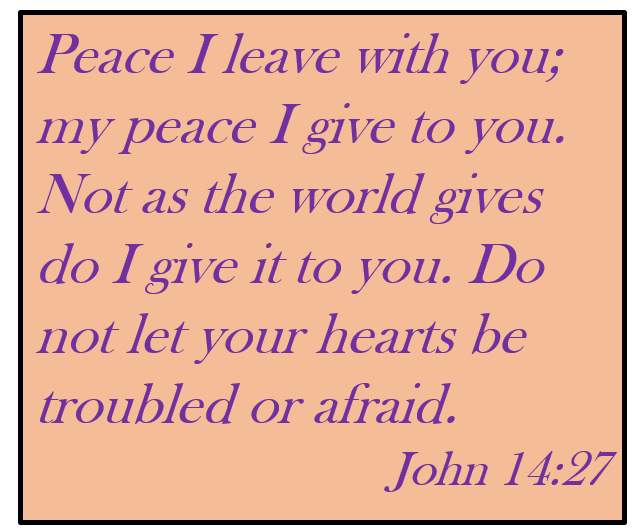 For other translations of these verses, use the scripture link and the drop-down menus. We often take a look at how the exiled people prepared to return to Jerusalem; we also reflect on how the people who journeyed home depending on God to protect them rather than troops and arms. Today we a look at the same story a little further along, and from a different perspective – that of the builder/administrator Nehemiah. This rebuilding of all that has been lost is not an easy task; it is a long and arduous process ans nothing ever feels complete. Indeed, the writer records that the enemies of Israel, once they hear that the walls and gates of that great city have been rebuilt, plot to bring the nation down again; yet even so, the people are exhorted to confide in God alone. We hear in Nehemiah’s own words (6:15) that our enemies lost much face in the eyes of the nations, for they knew that it was with God’s help that this work [of rebuilding] had been completed. Reading further, we see how plots and their schemers roil around these people who huddle in the ruined glory of their ancestors as they try to rebuild. The remnant nation is shielded from her enemies as restoration – through God – transforms rubble to beauty. Once the outer structure is established, Nehemiah begins to re-organize within and he re-arranges the people to protect the little gain they have purchased. Being wise and following the call of Yahweh, Nehemiah knows that greed will spark jealousy in their enemies and so he takes a census to count the flock, to present them as delivered by their God. We have visited with Ezra and Nehemiah before in the Noontimes, and we have watched this pair of men – the priest and the administrator – work in concord to save a humbled nation from harm as she returns home. We might marvel at the trust they place in God as they take on the responsibility of shepherding these faithful in their process of restoration. When we allow God to assist us in our recovery from calamity . . . and when we have rebuilt the doors and gates of our precinct . . . when we have set up gatekeepers and appoint night watchmen to guard against further damage by old and wily foes . . . we must rely on God to put into our hands all the tools that we will continue to need as we once again flourish in the sun. For if we have trusted God with the great misfortunes on our lives, so must we trust him with the many small mishaps of the day. This God who loves us is capable of great and small deeds. When we find ourselves at stopping points in our process of rebirth, we will also need encouragement to continue to progress to full and joyful renewal and rejuvenation. When we place our trust in God, when we turn the long and difficult process over to the one who creates all good . . . then we too will want to take our census and to count ourselves as present and as saved by our God. A Favorite from June 14, 2009.